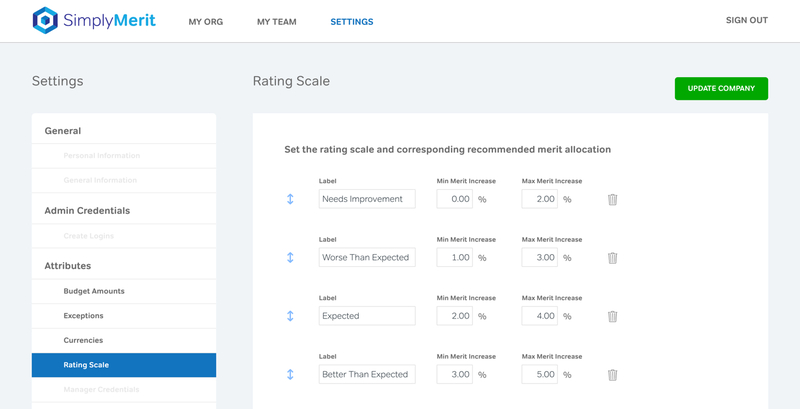 SimplyMerit is a tool that helps companies create top-down budget allocations. Of all the HR Software available on the market today, it’s hard to find an affordable interface where administrators and managers can allocate performance based merit, bonus, promotion, lump sum, and other cash amounts to employees within their company. The project goal was to have one workflow in which all of these metrics can be allocated from the top down within a seamless user experience, support request and approval transactions, and provide full company budget control on the admin side. Most projects require a deep dive into the subject matter during our inception workshop, and this was no exception. It was essential to gain an understanding of the metrics and exceptions most human resource departments deal with when budgeting and allocating merit within a large company. Neil and his fellow experts provided their veteran insight into the concept of planning company budgets. This helped foster a clear dialogue with us about the tools HR departments required to best optimize the SimplyMerit interface. The SimplyMerit logo is strong yet approachable. It complements the product which deals with the mathematical task of merit allocation, but does so in a way that is not daunting. The colors are clean and calming, with a hierarchy of stronger colors associated with submissions and approvals. Font choices are visually rounded and tidy; there are many tables that display important information, and it was important that everything be clearly labeled and easy to read. With such a distinct hierarchy of information, the final product resulted in a simple, straightforward interface to make it easy for managers to quickly drill down into their company structure. It also works as a management tool for higher ups that want to manage their whole company and the individual organizations and teams which make up an organization. View all teams within your organization with expandable blades. Each blade contains key metrics about the team so that managers can quickly identify important issues. Managers can drill down to manage compensation for only their direct reports, with a comprehensive set of inputs and options to manage an individual’s merit, promotion, and other compensation factors. 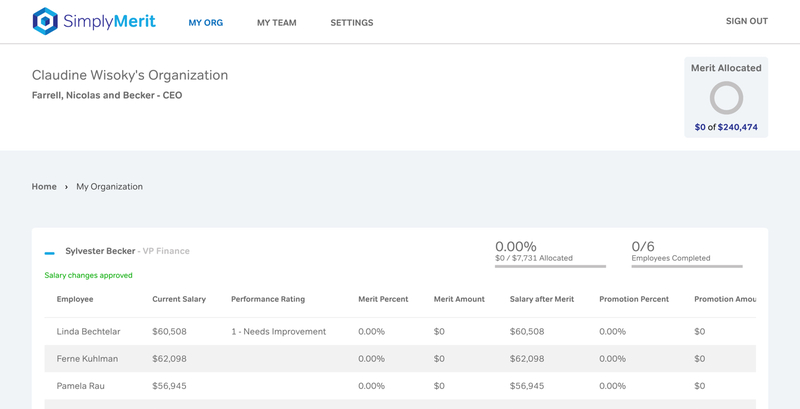 Merit and bonus allocation are updated in real-time as managers make changes to their teams’ compensation. 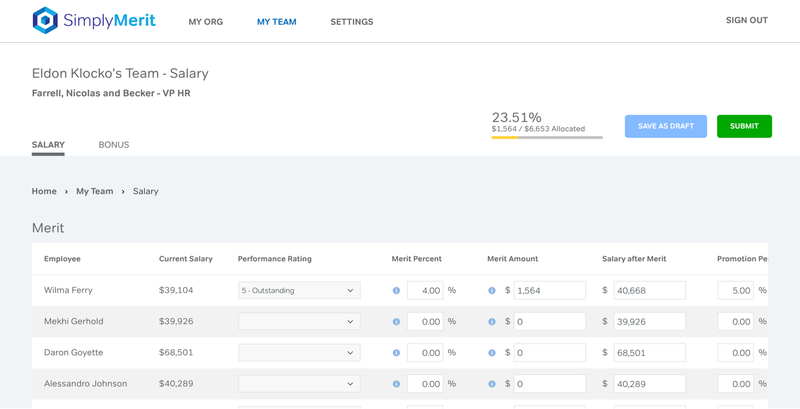 View comparisons of allocations to targets across a manager’s team, and across the organization. Search for an employee within the organization by his or her name, email, or manager name. Quickly navigate to that employee’s blade within the organization, or to their team page. SimplyMerit supports over 140 currencies, and uses reliable conversion strategies. International teams can manage compensation using their local currency, while admins and senior leaders see the data rollup in the company’s base currency. Companies can easily import data from a spreadsheet or directly from their payroll system. This greatly reduces the administrative effort needed to kickstart the compensation management process. Once the compensation cycle is complete, administrators can easily export all of the organization’s data. These exports make the following cycles even easier by being able to import that data as historical values that SimplyMerit tracks. Use the configuration panel to draft a letter with dynamic employee data. These letters can be emailed to managers to pass on to their employees with the details of their compensation adjustments for the year. Our goal was to reduce the amount of time spent on the budget allocation process by 50%. SimplyMerit provides a clean, modern experience where dynamic fields update in real time to reflect the exact merit amount employees are receiving, and the overall effect it has on company budget. With a fully customizable admin settings interface, this tool provides company executives with complete control over budget metrics, full transparency from the top down, and an efficient workflow for request and approval processes. SimplyMerit has developed a strong user base, and formed many partnerships that strengthen the platform with leading industry insights, and easy-to-use integrations. Within its first year, SimplyMerit onboarded several large customers. One customer has over 1,500 total employees, each of which was imported and managed throughout the compensation cycle. SimplyMerit has partnered with several big names in the HR management space, including ADP, Namely, Payfactors, and Criterion.